It's been a while since I've done a first impression post so it's kind of exciting to get back into one! For this FI post, I'm giving you guys my initial thoughts on the Whip Hand Cosmetics Set The Stage Face Primer. Before I begin, I want to comment on the communication I had with the PR Manager, Monique. She was so incredibly sweet and patient with me and very prompt with answering all of my questions. I really want to thank her for not only letting me try out this primer but also having fantastic communication with me! I've had this product for a few months but it took me some time to get around to testing it out. I haven't tested it out thoroughly (longevity, difference with and without under makeup, etc) as you can probably tell since this isn't a full review. First off, one great effect of this primer is that it makes your skin feel incredibly soft and smooth! The texture is interesting and hard to describe, it's almost like a whipped gel and blends effortlessly. Another pro is that you only need the tiniest bit for each section of your face. This container does look itty bitty but it's actually a "normal" sized primer since it's 1oz and I feel like it will definitely last a while. As far as smoothing lines, I have to say YES it definitely does! I apply this over lines and I swear they almost instantly melt away. When I first started using this I didn't feel like I saw a difference at all and soon enough I realized my problem was that I was using too little. I'm talking hardly any. You really don't need a lot but I was taking not a lot a little too far. (Or a little too less?) Once I got the right amount on, I was really in shock. I'd compare my expression to the first time I used Urban Decay's Supercurl Curling Mascara. Jaw dropping. It left such a smooth surface and if not for redness, I wouldn't of felt the need to even add foundation. I've not yet come across any cons that I'm sure of. The only concern I have so far, which may not even be related to the primer, is that I feel my skin looks a little patchy when I wear this under makeup. However, since I've been gently exfoliating daily like I used to, I haven't really noticed this. I'm thinking it may of been a result of not exfoliating as I should have been and using topical acne medicine that is a little drying. (Despite still using moisturizer) This is something that I'll be keeping an eye on, though. Now, I haven't tried too many primers so you can take my results with a grain of sand since I have very few other products to compare it to and it may work as well as some other primers. However, I'm definitely loving my results well enough to not feel the need to look for other primers. You can read more details on this primer on the Whip Hand Cosmetics website where it retails for $39. Learn more about Whip Hand Cosmetics here! 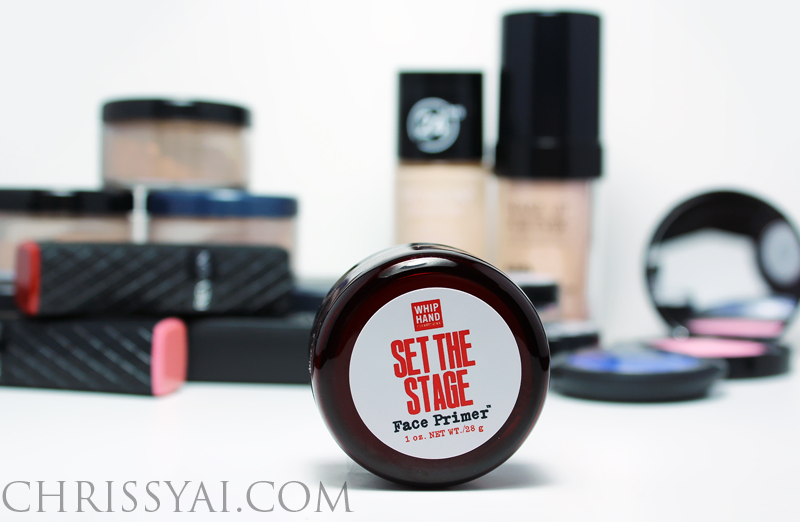 First thanks for the wonderful review of our Set The Stage Makeup Primer! In terms of the "patchiness" you mentioned when used under makeup, there could be a few different reasons for this. You are dead on about the exfoliating...I have the same issue with my skin. Although, Set the Stage addresses texture, and does hydrate where needed, exfoliation always helps. I hope this helps and again, THANK YOU for your amazing feedback. We love hearing all reviews, since that's how we get better and we can continue to produce products that our clients love and talk about.